Did you know that UpToDate, the evidence-based, peer-reviewed information resource for health practitioners, makes it easy to check for drug interactions? Just start at the library homepage (http://library.villanova.edu) and click Databases A-Z. Then choose UpToDate. At the UpToDate search page, click drug interactions. 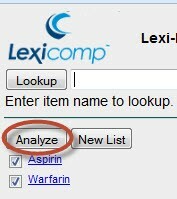 This will take you to the Lexi-Comp comprehensive drug-to-drug, drug-to-herb, and herb-to-herb analysis software. Type in the name of two or more medications and/or herbal remedies for which you’d like to check possible interactions. The database will respond with a list of generic and brand names. Check off your choices and click Analyze. 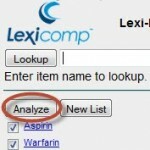 Give Lexi-Comp on UpToDate a try! K. Harrison, A.L. Marske. Nutritional content of foods advertised during the television programs children watch most. Am J Public Health, 95 (2005): 1568–1574.